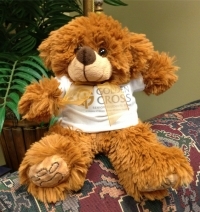 Meet the newest Golden Cross employee! Please meet “Wes“, the newest employee of Golden Cross. We searched high and low for just the right person to take on the new title of Goodwill Ambassador for the Golden Cross Senior Residents Fund. Wes brings a host of experience in making people smile and feel comforted. His certification as a “hug-ologist” makes him a very welcome addition. He takes his job seriously and strives to warmly welcome residents moving in to their homes. In just few short months Wes has become a rock star of sorts in our communities. ***For a limited time, you can have your very own larger version of “Wes”. He is a full 14 inches tall and just as adorable. Simply make a $100 or more donation by clicking the Give Today button and indicate on the PayPal message that you would like your very own “Wes”.